Partiallymade of critical technology bought from Russia, a South Korean space launcherwas scheduled to rocket into history Wednesday on the country's first jauntinto Earth orbit. But the launch was apparently postponed eight minutes beforeliftoff due to an unspecified problem. The KoreaSpace Launch Vehicle 1, a two-stage rocketmade from Russian and Korean components, was slated to lift off in a windowstretching from 0740-0920 GMT (3:40-5:20 a.m. EDT) Wednesday from the new NaroSpace Center about 300 miles south of Seoul. Korean news outletsreported officials would likely target launch for around 0800 GMT (4 a.m. EDT),or about 5 p.m. local time. Fueling of the KSLV's firststage was expected to begin about two hours before launch and an automatedcountdown sequence would commence 15 minutes before the appointed liftoff time,according to the Korea Aerospace Research Institute. The108-foot-tall rocket was slated to launch southward from its island launch pad,crossing over the Sea of Japan and accelerating to more than 17,000 miles perhour in less than eight minutes. See our launchtimeline for more details. Ifsuccessful, thehistoric launch would have placed South Korea in an elite group ofspacefaring countries with a domestic orbital launch capability. The formerSoviet Union launched the world's first artificial satellite, Sputnik 1, inOctober 1957. The United States followed with the successful launch of Explorer1 in January 1958. France, Japan, China, theUnited Kingdom, India and Israel later developed and successfully flew theirown space launchers. Engineers rolled the KSLV 1 rocket froman assembly hangar to the launch pad on Monday. Ground controllers rehearsedcountdown procedures and gave a "go" for launch on Tuesday. 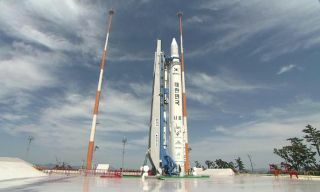 South Korea began designingthe rocket in 2002 and originally hoped to launch the booster in 2005. After early developmenttrouble, Russian rocket-maker Khrunichev signed on to the KSLV 1 project in2004, spearheading the first stage and construction of the Naro launch site inJeolladam-do province in the southwestern part of the country. The first stage is poweredby an RD-191 main engined fueled by kerosene and liquid oxygen. Designed byRussian engine-builder Energomash, the propulsion system is based on the RD-171and RD-180 engines that propel Zenit and Atlas rockets toward space. Officially named theUniversal Rocket Module, the first stage was developed for Russia'snext-generation Angara rocket, a modular design engineers hope will haul small,medium-sized, and heavy satellites into orbit. But Angara's developmenthas been stymied by a series of delays, and the first stage of the new rocketwill make its maiden flight from South Korea. About 160 Russian engineersare present at the Naro launch site to support the mission, according toreports from the Korea Times. Wednesday's launch attemptwas postponed from July 30 and Aug. 11 to give Khrunichev officials more timeto analyze results of a critical engine test in Russia late last month. The RD-191 engine isdesigned ramp up to 430,000 pounds of thrust at liftoff, burning for nearlyfour minutes to guide the rocket to an altitude of more than 120 miles. After coasting throughspace for almost three minutes, the KSLV's Korean-built solid-fueled secondstage is expected to ignite for a one-minute firing to accelerate the rocket toorbital velocity. The launcher was expecteddeploy the mission's 219-pound payload nine minutes after liftoff, according toKARI. The Science and TechnologySatellite 2, or STSAT 2, is designed to measure radiation in Earth's atmosphereand demonstrate several key technologies Korean scientists could use on futurespacecraft.